Mike Ullery/Call File Photo Piqua quarterback Mick Karn passes the ball last week. 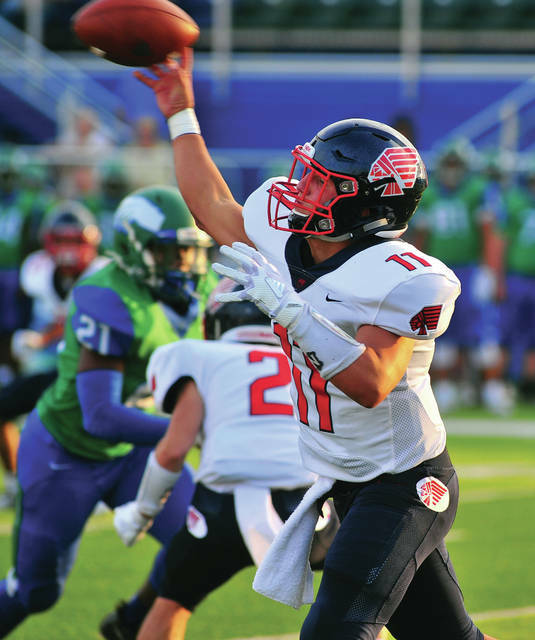 The Piqua football team is looking to bounce back from Friday’s 42-22 loss to Chaminade-Julienne and begins a three-week homestand with Lima Senior visiting. The Spartans had a rough start as well, losing 56-13 to a strong Northmont team. But, Piqua football coach Bill Nees said don’t be deceived by that score. Senior quarterback Rashad Wallace led the Spartans. He completed 11 of 24 passes for 103 yards, with one touchdown and two interceptions and led the rushing attack with 31 yards on 11 carries. Brayden O’Dell had four catches for 56 yards. Nees said the Spartans bring a lot of athleticism. Joquise Sherif and Brandon Taylor had six tackles each for Lima Senior. Dewayne Cowan, Jawan Anderson and Jarius Cobb all had five. Cowan, EJ Cameron and Jermaine Daniel all had interceptions. Piqua senior quarterback Mick Karn (5-11, 192) provided most of Piqua’s offense last Friday. He completed eight of 13 passes for 119 yards with a TD and an interception and rushed for 116 yards on 21 carries. Junior Makeegen Kuhn (6-1, 218) rushed for two TDs, while leading the receivers with three catches for 52 yards. Senior Jake Meyer (5-9, 151) had a 45-yard reception,while senior Owen Toopes (6-2, 171) caught a TD pass and junior Jerell Lewis (6-1, 242) caught a PAT pass. Kuhn led the defense with 10 tackles. Sophomore linebacker Ca’ron Coleman (5-10, 176) had eight tackles, while sophomore defensive lineman Lance Reaves (6-0, 263) had seven. But, Chaminade quarterback Ryan Minor completed 14 of 19 passes for 211 yards, Marquis Henry rushed for 112 yards on 15 carries and Dominic Wilcox caught four passes for 86 yards. Now, Piqua gets to stay at Alexander Stadium/Purk Field for three weeks. To try and get a bounce-back win. https://www.dailycall.com/wp-content/uploads/sites/30/2018/08/web1_082418mju_fb_phs_11-1.jpgMike Ullery/Call File Photo Piqua quarterback Mick Karn passes the ball last week.